We’d love your help. Let us know what’s wrong with this preview of To Kneel and Kiss the Earth by L.R. Heartsong. For nearly five years, the Soul Artist Journal, a weekly e-column/blog by healer/author L.R. Heartsong, explored the art of living a meaningful connected existence, celebrating "a life for the senses." Though the posts were diverse, the underlying theme was always, how do we nourish the soul? 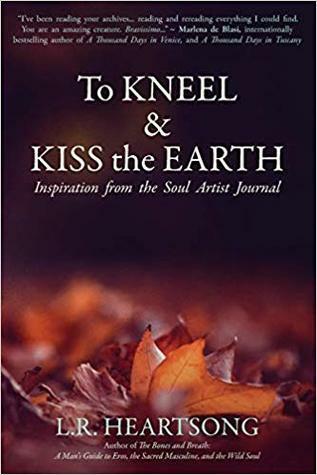 To Kneel and Kiss the Earth is the first compilation volume, a gathering of posts For nearly five years, the Soul Artist Journal, a weekly e-column/blog by healer/author L.R. Heartsong, explored the art of living a meaningful connected existence, celebrating "a life for the senses." Though the posts were diverse, the underlying theme was always, how do we nourish the soul? To ask other readers questions about To Kneel and Kiss the Earth, please sign up. Thank-you River for this inspiring and wonderful gift. I have read your words slowly, allowing you to ground me, make me laugh, and fill me with appreciation and gratitude for our beautiful Mother Earth. "Nature always brings me home to myself - my most authentic, expansive, best self - the one who is soft, flexible, receptive and aware." Yes - most definitely yes. I urge others to read this book and embrace walking at the edges too. I just bought this latest book from L. R. Heartsong. I'm already enchanted by the way this author takes my mind away from the challenges of the day and reminds me with such beautiful writing that life is about so much more. For a busy person, like myself, I find the selections to be just the right length, easy to pick up at any time, and a yummy treat for the soul. A beautiful jouney through the words of a beautiful soul. L.R. Heartsong has woven his words into the fabric of my soul for some time now and will for a long time to come. To Kneel and Kiss the Earth (that says it all) is a book that is within reach at all times, to read and read again. Thank you River for the ever evolving journey!